Everyone is welcome to our event at Eno River State Park on Sunday, February 17. Check-in at the Fews Ford shelter, just west of the loop parking lot at the end of Cole Mill Road. (GPS coordinates = 36.073616, -79.007005). IMPORTANT: DO NOT PARK IN THE LOOP PARKING LOT. Instead, just before getting to the parking lot, turn left (look for the BOK sign) and follow the park’s service road for approximately 200 meters. Turn around on this road (busses can use the turn-around loop), and then park on the right (south) shoulder. See the Figure below for a map of the parking and registration area. Timing and classes. Start any time between noon and 2:00. 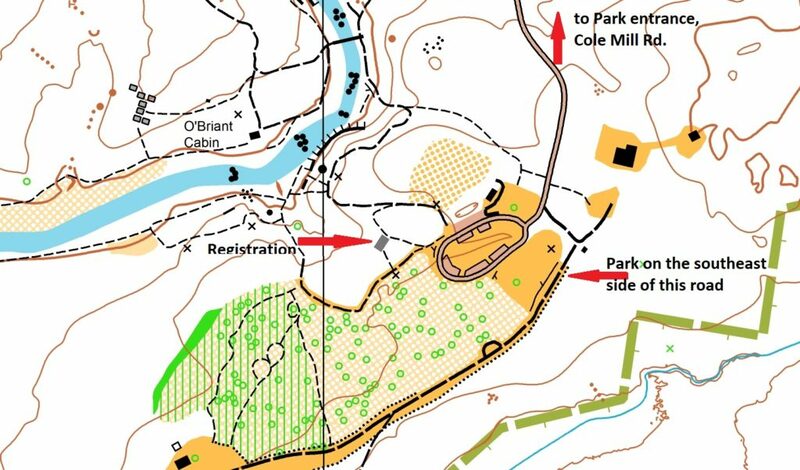 If you’re new to orienteering, please arrive in time to get signed-in before attending one of the two classes that will be offered at 12:30. If you have never orienteered before, consider attending the beginner class at 12:30. If you have limited experience or feel “stuck” at the intermediate level, take our intermediate class at 12:30. Make sure that you report back to the finish by 3:00, because we will begin picking up all of the check points (controls) at that time. IMPORTANT: PRE-PAYMENT REQUIRED. Park rules require that we collect event fees outside of the park. Therefore, you must pre-pay for your registration online. Follow this link to pay for the event. Non-members typically will need to pay for both an entry fee ($7) and a fingerstick rental fee ($5). If you’re going in a group, you may also want to pay for additional maps. Note also that payment is different from registration. Even if you have paid, you will still need to register for the event and sign our waiver. Follow instructions in the next paragraph if you want to pre-register.